Free version is English only and contains Ads. The maximum number of users per computer is two. Click here to visit our web store for licensing options. You can choose to buy Standard or Premium version. 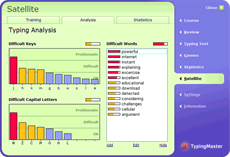 TypingMaster 10 Premium version has a feature to add your own customized typing test texts. Just click ADD button on Typing Test section to add your own text file. There is also DELETE option to remove your own texts when no more needed. The text file can be easily done with Windows Notepad (Save type: Text file, non unicode). Since the Meter monitors your actions on the keyboard (for example the fluency of your typing, the number of errors and corrections you make), you can write in any language of your choice and the program will still detect your problems areas. You can install this software if your operating system is Windows 10, 8, 7, Vista or XP or 2003, 2008. When you download, you get a popup window asking you whether you wish to save the program to disk or run it from the current location, select Run and click on 'OK'. You will need admin rights to complete the setup. Q:I cannot see the Typing Meter window on the screen. A: Please click taskbar icon Typing Meter to make it appear if its minimized. A: It takes a moment before meter starts to measure your typing skills. The first word is always ignored. Q: Is the Typing Meter secure to use? If you get an update available message during a startup screen, and click to download, a window will appear asking you whether you wish to save the program to disk or run it from the current location, select Run and click on 'OK'. You can uninstall this software from Windows Control Panel, Add/Remove Programs section. You need to start TypingMaster in order to see the complete list of all TypingMeter users. From this user list, please click once the user name that you want to delete and then click DELETE USER button from the bottom of screen. (c) 2018 Typing Master Inc . All rights reserved.